ok, not really. but with the flooding in nashville and yet another evacuation of times square today, i thought i would share with you something thats really been on my mind lately. i wrote on my goals list for march to “get an emergency kit together”, and as of now it is sitting in the closet ready to go if needed. i know we wont need it, but i like knowing its there. i wanted to tell you a little about my kit, and maybe give you some ideas for making one of your own. as you know by now, we live in NYC, so we have to be prepared for not only natural disasters, but stupid USA-hater-made ones also. however you dont need to live in a “big city” to need to be prepared. we have family and friends in hurricane zones, earthquake zones, flood zones, and who-knows-what-else-could-happen-at-this-point-zones. even places that dont seem like that they could be hit by natural disasters will sometimes surprise you(hurricane fran, anyone? )so its a good idea to look at your area and see what you need to be prepared for. for example i didnt know NYC could be hit by a hurricane, but apparently it can. the kits i put together serve two purposes….one if we have a situation where we are still at home, but without electricity or water, and one where we need to evacuate and take things out of the house quickly. everything came in a big box with a note that said they wanted us to put it in the backpack ourselves so that we were familiar with the products and knew what was in there. so thats all our “survival” stuff. ….basically anything we would need if we had to leave the house at a moments notice, whether because of evacuation, fire, whatever. with this kit we could survive in a hotel or shelter for a couple of nights and have most important things with us. we also keep a smaller version of both of these in matts car in case we arent home if something happens. i totally realize that we might not be here to get the bags if something goes down, and having the bags wont stop anything from happening. but i would rather have them ready to go and if we can get to them, we have them…instead of saying “i wish i had gotten things together before i needed them”. i would rather these things sit in the closet all together for the rest of my life, not being used, than scattered all over the house where its hard to find when we need them. not trying at all to be a downer, but with everything happening all over the world, i just feel its so important to be as prepared as possible. and when its all done, you will feel so good about it- knowing you are doing what is in your control, and letting go of what is not. 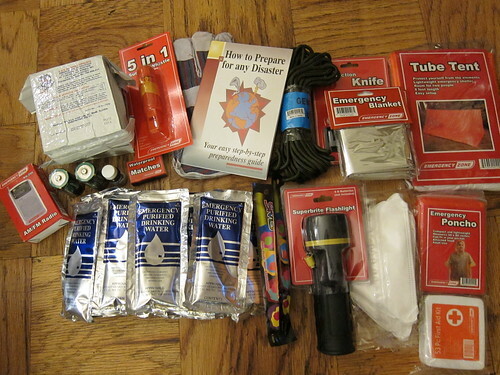 if you dont have some sort of emergency kit, i urge you to get one together. it honestly doesnt take that long to do it, especially if you buy some of it already pre-made, then add your personal items to the mix. sorry for a slightly depressing post. i choose every day not to live in fear of what could happen, but that doesnt mean i have to live in denial. being prepared is just common sense, and it gives you what little piece of mind you can have in a world you can not control. leave a comment if you are going to make a kit, or if you already have one and want to add ideas!